3D Interactive Sthlm is the leading company in Sweden when it comes to creating augmented reality (AR) content. With 40+ AR projects completed in the last three years, we have acquired expert knowledge on AR and on how it can be used in various industries to improve sales, explain product USPs and digitalise printed communication. Among our clients are companies within the real estate, defence, yachting, aviation, banking and telecom industries. 3D Interactive Sthlm was founded in October 2010 with a vision to change the way people visualise new housing via the use of interactive 3D solutions. We wanted to get away from static material like 3D images and instead provide interactive experiences where users can interact with 3D content on computers. After seeing AR for the first time, we realised the potential in using it for visualising and communicating new houses and products. Six years ago, the ability to create AR for smartphones was limited due to inadequate hardware, software and even expertise on how to create the best experiences. 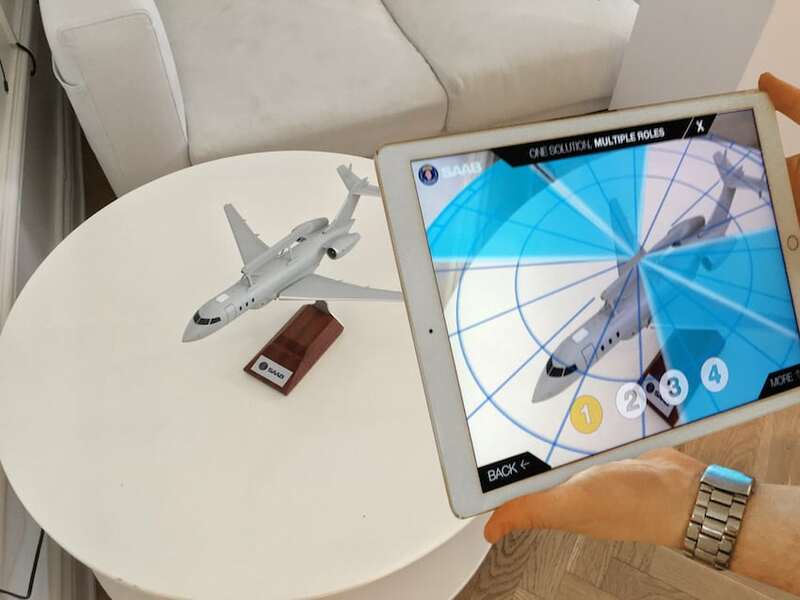 Nevertheless, we started to offer AR as part of our product portfolio as early as 2011, though it wasn´t until 2014 we took the strategic decision to focus solely on AR. We realised then that all the pieces needed to create strong and effective AR solutions were in place when it came to hardware, software, and expertise. Most importantly, our clients were ready for it. Since 2014, we have been developing AR solutions for a wide range of clients in various industries, and we have always pushed ourselves to increase our offering to match our clients’ demands. We do not come from the gaming industry, which many developers of AR do, so we don´t offer a random AR game for our clients. We focus on finding the best AR solution to make sure customer benefits are maximised for a specific project or campaign. Sometimes this requires detailed animated 3D models, and sometimes the focus is more on 2D material like augmented videos. To measure the success of a campaign, we provide statistics on how the AR application has been used and we also include multi language options if the client wants to use the same campaign in different markets. This full-service solution has given us the opportunity to work with customers as Saab, Swedish National Bank and several of the biggest real estate companies in Sweden. 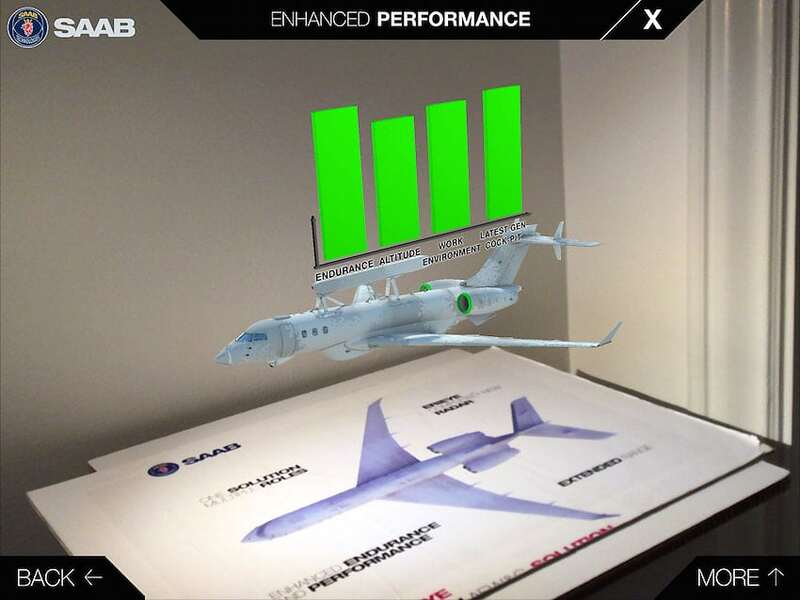 For Saab, we used the full potential of AR and its application in different contexts in both marketing and product description. Saab contacted us in November 2015 regarding the opportunity to use both print and object-based AR for their products. It has resulted in a concept that Saab uses in exhibitions and events around the world. We developed the public app Saab AR available on the Apple and Google app stores as well as an internal app that Saab uses in its shows. The public app is used to communicate with clients before and after events. It contains personalized invitations to events and added AR content on giveaways such as Experience Cube, Gripen Calendar and Coasters. Saab will also include AR on several pages in its annual report for 2016. The app is scalable, and Saab can easily replace and add content without having to develop a new application. For the internal app, we were one of the first companies in the world to use object-based AR whereby physical models of different products serve as markers. For each product, we visualized the USPs that Saab wanted to highlight. 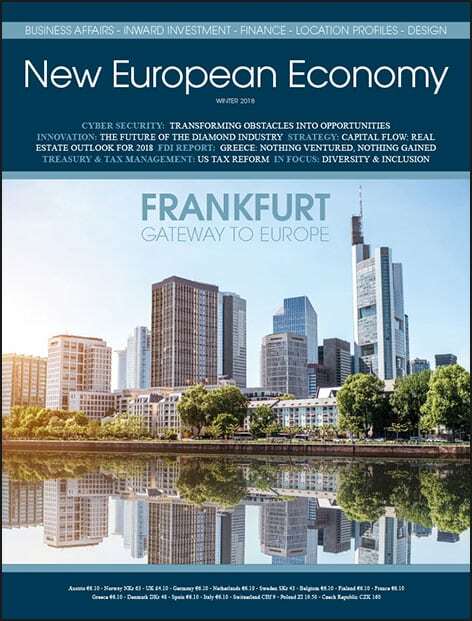 Two examples are Gripen and GlobalEye. The results have seen potential customers spend more time with Saab in its exhibitions and events while it can visually display the USPs and promote itself as an innovative company that uses the latest technologies not only in its products but also in presentation materials. For Swedish National Bank, we produced an AR application to help communicate the biggest banknote exchange of modern times. With the Kolla Pengarna app, users can scan both new and existing bank notes to learn about the security features as well as access information about when the old banknotes become invalid. The app quickly became of the top 10 most downloaded apps in Sweden when released in July 2015. An important part of the app is that we have adapted it for the visually impaired, thus giving them the opportunity to learn about the new banknotes by scanning them with the app. For the real-estate industry, we have produced several AR-projects helping to visualise future housing in 3D before being built. Whether it is 3D floorplans, sun studies or positioning life-size 3D models of a house in AR where they will be built, we can do it and we have done it. Many examples can be found in our popular cloud-based app GlobeAR, where we can add new content and projects seamlessly. With GlobeAR we have reduced the threshold that some companies have to use AR as a part of their communication and marketing strategy. There is enormous interest from clients to add content to GlobeAR, and we are happy to accommodate it. We foresee huge development in AR and VR in the coming years. We intend to continue to lead development in these two areas, and we are excited to have the opportunity to be Chapter President of Sweden for the VR/AR Association, a global industry association for augmented, virtual and mixed reality.